posted by Howard B. Owens in elba, news, accident. A vehicle has hit a utility pole in the area of 7189 Road, Elba, and there is airbag deployment, but there is nobody in the car, according to the caller. Elba fire and Mercy EMS dispatched. A trooper on scene reports wires down. UPDATE 11:37 p.m.: The pole is snapped in half. UPDATE 11:40 p.m.: Heavy front-end, driver-side damage. UPDATE 11:48 p.m.: Mercy EMS back in service. No patient found. posted by Billie Owens in crime, news, notify, Le Roy, batavia, elba, bergen, Basom. Robert W. Redinger, 29, of Dublin Road, Bergen, is charged with: DWI -- combined drugs or alcohol; unlawful fleeing a police officer in the third degree; reckless driving; failure to yield the right-of-way to an emergency vehicle; refusal to take a breath test; running a red light; moving from lane unsafely (four counts); speed in zone (four counts); unsafe start (two counts); failure to stop at stop sign (three counts); and unlawful possession of marijuana. Redinger was arrested at 2 a.m. on Dec. 29 on Harvester Avenue in Batavia after he allegedly refused to pull over for a traffic stop. He allegedly proceeded to lead police on a high-speed pursuit; his vehicle stopped as a result of him running out of gas. He was allegedly found to be intoxicated and then he was processed and arraigned in city court and put in jail. (Bail status is not mentioned.) The case was handled by Batavia Police Officer Darryle Streeter, assisted by Officer Mitchell Cowen. Trace G. Brewer, 18, of Montclair Avenue, Batavia, is charged with third-degree burglary, petit larceny and third-degree criminal trespass. Brewer was arrested at 8 a.m. on Dec. 30 on Montclair Avenue after he allegedly entered a shed and stole property. He is due in Batavia City Court at a later date. The case was handled by Batavia Police Officer Stephen Quider, assisted by Officer Jason Ivison. Shah L Zajic, 42, of Batavia, was arrested in the early morning of Dec. 27 by the Le Roy Police Department and charged with: felony driving while intoxicated; felony aggravated driving while intoxicated with a BAC .18 percent or more; unlawful possession of marijuana; speed in zone; and failure to signal. At about 2:25 a.m. Dec. 27th, an officer assigned to DWI Crackdown Patrol observed a vehicle allegedly moving at a high rate of speed on Wolcott Street in the Village of Le Roy. A lawful traffic stop was initiated after the vehicle also failed to use a signal while making a turn. The operator was identified as Zajic. After a subsequent investigation it was allegedly found that Zajic was intoxicated. Zajic was taken into custody and processed without incident; arraigned in Town of Le Roy Court put in jail with bail set at $2,500 cash or $5,000 bond. Zajic is due back in court on Jan. 22 to answer the charges. Derrick L. Washington, 46, Roosevelt Avenue, Batavia, is charged with: DWI -- BAC of .08 percent or more; DWI -- first offense; speeding; unlicensed operator; aggravated unlicensed operation. On Dec. 31 at 11:20 p.m. on Liberty Street in Batavia, Washington was arrested on these charges following a traffic stop. After his arraignment in city court, he was jailed in lieu of $1,000 cash or bond. The case was handled by Batavia Police Officer Christopher Lindsay, assisted by Officer Mitchell Cowen. Ranelle E. Reuben, 36, of Judge Road, Basom, is charged with: driving with a BAC of .08 percent or more; DWI; aggravated unlicensed operation in the first degree; following too closely; and leaving the scene of a property damage accident. Reuben was arrested at 5:38 p.m. on Dec. 18 on West Main Street in Batavia. The defendant allegedly left the scene of a property damage accident after striking another vehicle and the defendant was allegedly intoxicated and operating the vehicle without a driver's license. Reuben was arraigned in city court and jailed without bail. Reuben was due in city court on Dec. 19. The case was handled Batavia Police Officer Jamie Givens. Billie L. Harper, 41, of Hutchins Place, Batavia, is charged with: criminal possession of a controlled substance in the seventh degree; unlawful possession of marijuana; driving while ability impaired by drugs; having a cracked front windshield. Harper was arrested at 9:07 a.m. on Dec. 23 on State Street in Batavia after a citizen's complaint of a subject slouched over the steering wheel of a vehicle. Batavia police responded and located Harper asleep in her vehicle at the intersection of Washington Avenue and State Street. After further investigation police allegedly found Harper to be impaired. The defendant is due in city court on Jan. 15. The case was handled by Batavia Police Officer Marc Lawrence, assisted by Officer Stephen Quider. Matthew T. Ryan, 42, of Henskee Road, Alden, is charged with DWI -- common law and aggravated DWI -- with a BAC of .18 percent or more. Ryan was arrested at 6:44 p.m. on Dec. 21 on Walnut Street in Batavia following the investigation into a vehicle complaint. He was due in city court on Jan. 2. The case was handled by Batavia Police Officer Mitchell Cowen, assisted by Officer Chad Richards. George Michael Hodges, 28, of Oak Street, Batavia, is charged with obstructing governmental administration in the second degree and harassment in the second degree. Hodges was arrested at 1:50 p.m. on Dec. 30 on Oak Street. It is alleged that he physically interfered with police while they were investigating a disturbance call on Oak Street. He was arraigned in city court and put in jail in lieu of $1,000 cash or bond. He was due in court on Dec. 31 to answer the charges. The case was handled by Batavia Police Officer Christopher Lindsay. Ernest D. Lane, 60, of Ellicott Street, Batavia, is charged with criminal mischief. Lane was arrested at 6:40 a.m. on Jan. 1 for allegedly intentionally breaking property that belonged to a female acquaintance. He was arraigned in Batavia City Court and jailed in lieu of $2,500 cash bail. The case was handled by Batavia Police Officer Frank Klimjack, assisted by Officer Nicole McGinnis. Adam James Gill, 30, of North Bergen Road, Bergen, is charged with second-degree criminal contempt. He was arrested at 11 a.m. on Jan. 3 on Church Street in Elba following a visit from probation in the Town of Elba. He was arrested for allegedly being inside the residence and in the presence of a protected party. He was arraigned in Oakfield Town Court and put in jail with bail set at $500 cash or $1,000 bond. He is due in court again on Jan. 9. The case was handled by Genesee County Sheriff's Deputy Robert Henning. Tiesha Deon Doward, 32, of Bank Street, Batavia, is charged with petit larceny. Doward was arrested at 12:38 p.m. on Dec. 31 following a shoplifting complaint at Tops Friendly Market in Batavia. Doward is accused of leaving the store with $99.69 worth of merchandise without paying for it. The case was handled by Batavia Police Officer Jason Ivison, assisted by Officer Matthew Lutey. Joshua J. Dibble, no permanent address, Batavia, is charged with petit larceny. Dibble was arrested on Jan. 1 on an active arrest warrant out of Batavia City Court charging him with petit larceny. It is alleged that Oct. 4 on West Main Street in Batavia that Dibble took a 12-pack of beer from a store without paying for it. Following his arrest on the warrant, he was arraigned and jailed in lieu of $1,000 cash or bond. He was due in court again on Jan. 3. The case was handled by Batavia Police Officer Chad Richards, assisted by Officer Christopher Camp. posted by Billie Owens in news, accidents, elba. A two-vehicle accident with minor injuries is reported at Oak Orchard and Lockport Roads, Elba. Elba Fire Police are asked to slow traffic at the top of the hill on Oak Orchard Road before the intersection. Two ambulances are responding, along with Elba Fire Department. Law enforcement is on scene. UPDATE 3:27 p.m.: Traffic will be reduced to one lane on one or both roads. 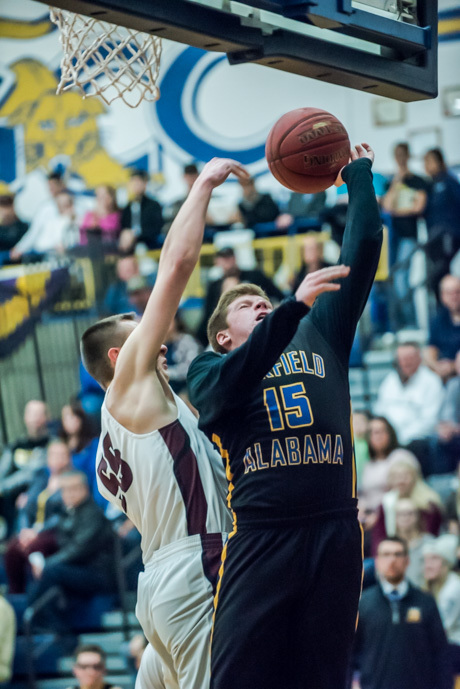 posted by Howard B. Owens in basketball, sports, news, elba, oakfield-alabama. 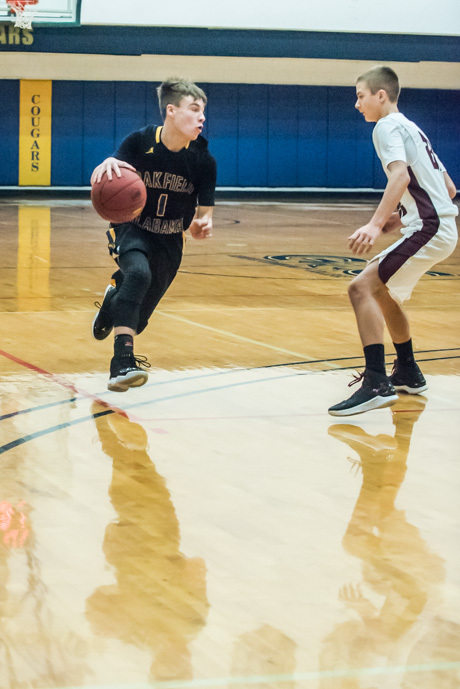 The Elba Lancers stepped on the gas in the final two minutes of their championship game in the Lions Tournament, smaller schools' bracket, against Oakfield-Alabama for a 69-61 win. The intense play of Colton Dillon (top photo), tournament MVP, and Jon Boyce overcame a 30-point performance by Joey Burdick for the Hornets. Dillon scored 18 points and Boyce scored 17. This was Dillon's third game back after missing the start of the season with an injury. He may have been the difference maker Friday night. "He's such a dynamic athlete," Coach Ciaci Zambito said. "I mean the things that he can do you really can't coach. I'm super lucky to have a kid like that. The other thing is, he is one of the hardest working kids I've ever even been around or let alone coached. You've got to kick him out of the gym every day and on Sunday mornings. He will text me tomorrow morning asking to get in the gym. I can guarantee that." Boyce, who has the big man on the court in Dillon's absence, said having Dillon back is one more piece of team chemistry that keeps the unit rolling. "This is a team sport," Boyce said. "You can't do it by yourself. Every night, sharing the ball, taking care of each other you always. It's not just one person that can do it all. We're all fighting. We all know our role. Coach talked a lot about roles before the game. The whole season he's been preaching it. We all know our role." 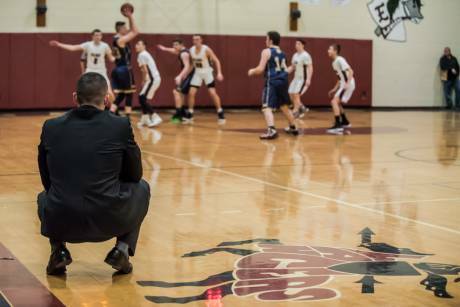 Zambito gave O-A Coach Ryan Stehlar and the Hornets a lot of credit. He knew they would be a tough matchup and he had to have his guys ready. "We really needed to match their intensity tonight," Zambito said. They play real hard and that's a testament to their coach. When we play Oakfield, we always know that we're going to get their best shot. He always has them ready to go. "The second thing, as far as a scheme goes, we needed to get back in transition. They push the ball really well even after makes, which is rare for a high school team. They really get down the floor well. So we needed to come back and be ready to play defense." Besides Burdick's big night (he hit five three-point shots), Travis Wiedrich scored 14 points for O-A. Elba outscored the Hornets 22-13 in the final quarter. posted by Howard B. Owens in basketball, sports, elba. 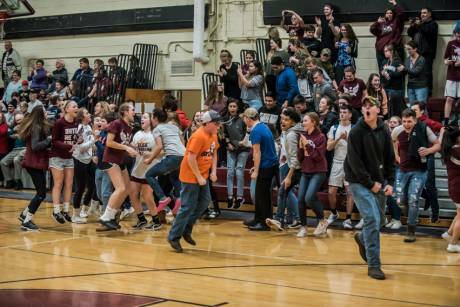 Brynn Walczak had a big night for the Elba in girls basketball against Perry, leading a second-half rally that secured a 61-40 victory for the Lancers. 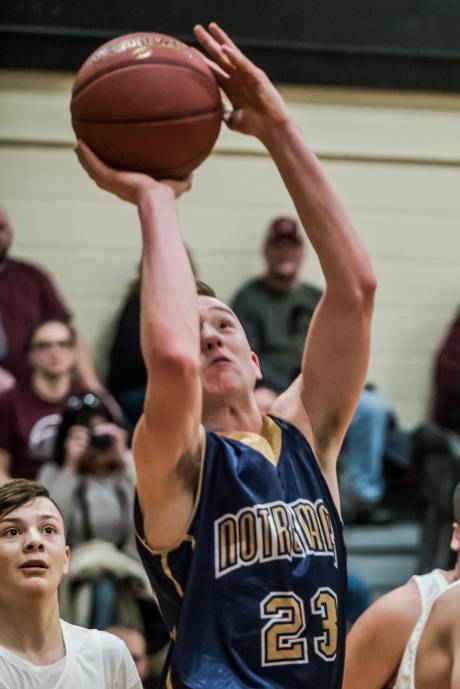 Walczak scored 23 points, hitting 10 of 15 shots and pulling down seven rebounds. Coach Tom Redband said she "brought a lot of energy" in the second half. Leah Bezon had a double-double with 15 points and 10 rebounds. Maddie Muehlig scored eight points and also stole the ball from opponents seven times. For Perry, Chelsea Pascoe also had a double-double with 11 points and 14 rebounds. Lily Jaques scored 10 points and Auburn Milholien scored eight. No report available for the Notre Dame game. 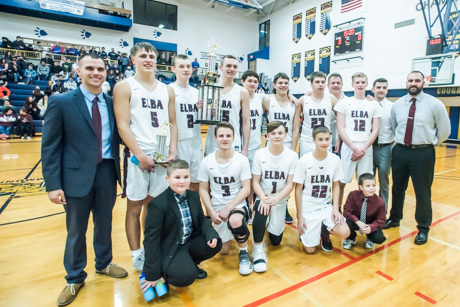 posted by Howard B. Owens in sports, news, basketball, elba, Lions Tournament. 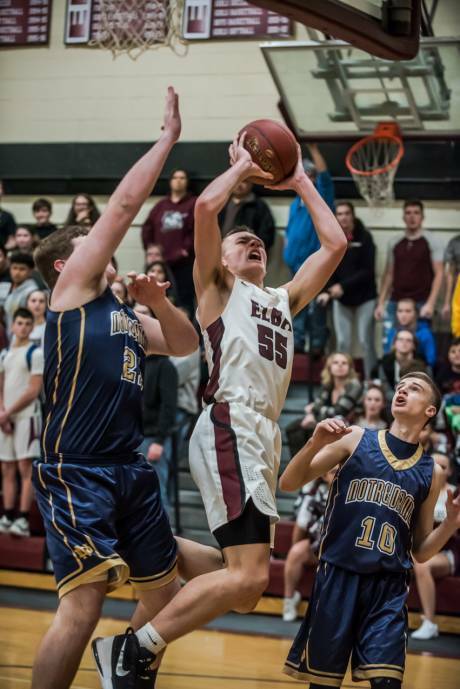 At the half, it looked like anybody's game but over the final two quarters, Elba took over in its Lions Club Tournament opening-round game against Mount Morris in the smaller schools bracket. 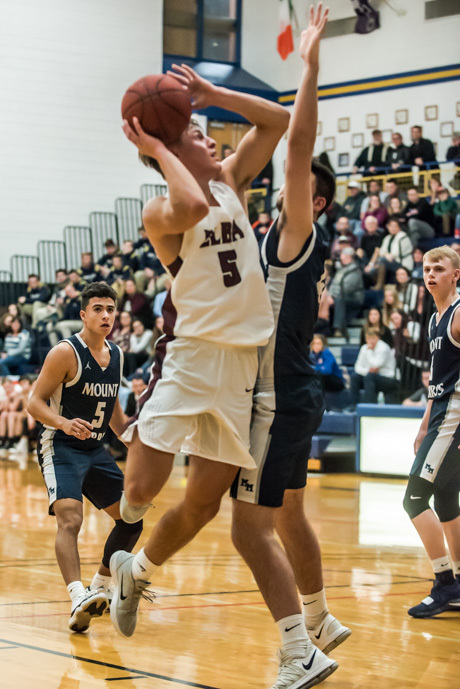 The Lancers topped Mount Morris 63-53. 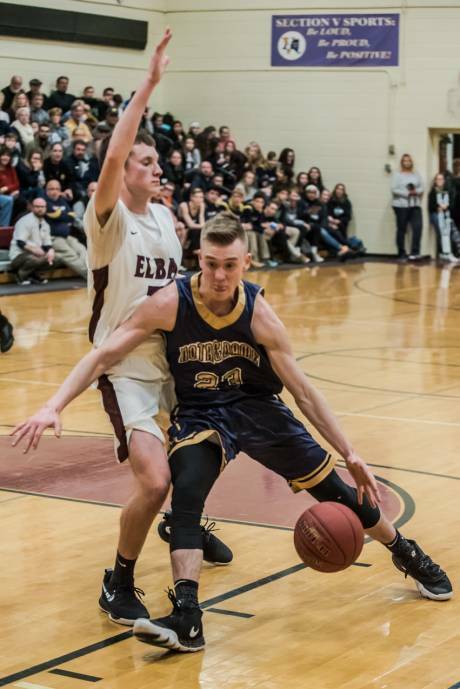 Colton Dillon scored 25 points and Jon Boyce added 20 for Elba. 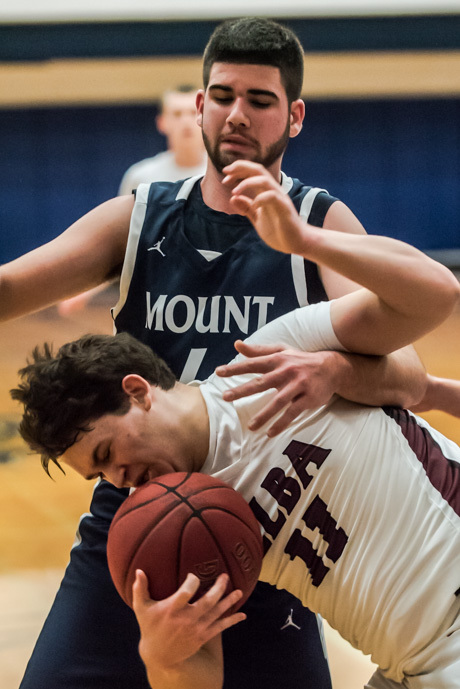 For Mount Morris, Dylan Cicero and Collin Young scored 15 points each. Elba will face Oakfield-Alabama in tonight's smaller school bracket championship at 7 o'clock. posted by Billie Owens in crime, news, notify, pembroke, elba, batavia, Pavilion. The victim of a domestic incident responded to the Batavia Police Department and an investigation determined that Iszon Richardson (right inset photo) allegedly violated a complete stay away order of protection. Richardson is suspected of holding the protected party at their residence on Jackson Street and refusing to allow them to leave. A short time later, the Batavia PD received information that Richardson had returned to the protected party's residence and police responded. Police did not release the date of the incident, but put out this report on Friday (Dec. 21). They located Richardson hiding and he was taken into custody and charged with: four counts of first-degree criminal contempt -- Class E felonies; three counts of second-degree burglary -- Class C felonies; and one count of unlawful imprisonment in the first degree -- also a Class E felony. Richardson was arraigned in Batavia City Court and put in Genesee County Jail in lieu of $30,000 bail. He is to reappear in city court at a later date. This case was investigated by Officer Christopher Lindsay, assisted by Sgt. Christopher Camp, Officer Mitchell Cowen, Officer Chad Richards and Officer Jamie Givens. Steven William Barnhardt, 27, of River Road, Pavilion, is charged with second-degree aggravated harassment and fourth-degree stalking. At 12:15 p.m. on Dec. 21, Barnhardt was arrested on the charges. After meeting a female a week prior, he allegedly continued to send text and Facebook messages and call the female, who lives on Barrville Road in Elba, after being advised to have to further contact. Barnhardt was arraigned in Batavia Town Court and released under supervision of Genesee Justice. An order of protection was issued by the court. The case was investigated by Genesee County Sheriff's Investigator Joseph Loftus. Gary David Doctor, 36, of Pembroke, is charged with: driving while ability impaired by drugs; unlawful possession of marijuana; driving left of pavement markings; having an unregistered motor vehicle; unauthorized sticker on rear window; and obstructed driver's view. On Dec. 20, Doctor was arrested on the charges, which stem from a motor-vehicle accident that occurred at 9:48 p.m. on Nov. 5 on Knapp Road in Pembroke. Doctor was released on an appearance ticket and is due in Pembroke Town Court on Jan. 22. The case was handled by Genesee County Sheriff's Deputy Kevin Forsyth. Damien M. Schoonmaker, 20, of Smith Street, Rochester, is charged with trespass. The defendant was arrested after allegedly driving around the property and racetrack of the Genesee County Fairgrounds at 1:43 p.m. on Nov. 30 without permission and causing ruts in the mud and grass. The case was handled by Genesee County Sheriff's Sgt. Ronald Meides. posted by Billie Owens in elba, news, Bingo. Readers Kevin and Sue Dart asked us to let everyone know that Bingo is canceled tonight at the Elba Fire Department. So now you know. posted by Howard B. Owens in Notre Dame, elba, news, sports, basketball. 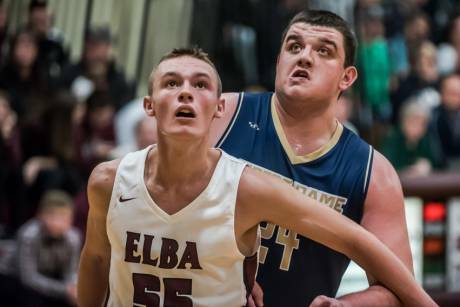 The Elba and Notre Dame early-season matchup at Elba was everything you expect an Elba vs. Notre Dame game to be: raucous crowd, and a battle to the end between two talented teams. This time, the Lancers came out on top 52-48, but it wasn't easy. 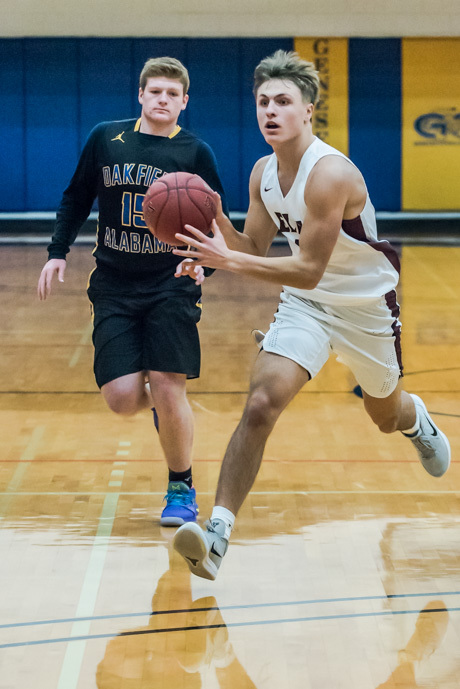 The Fighting Irish built up a 10-point lead, thanks to some hot shooting from Lucas Calarco and Spencer Masiti, and led 33 to 27 at the break but Elba kept the pressure on throughout the second half and seemed to wear Notre Dame down by the fourth quarter. "We shot the ball pretty well," said Notre Dame Head Coach Mike Rapone. "Our biggest thing tonight is we didn’t execute the last four minutes. We took some bad shots. We made some bad turnovers and made a few defensive mistakes. When you’re doing that on the road, you’re not going to come out on top against a good team." 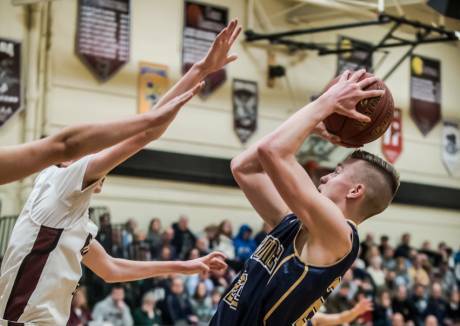 The Lancers were led by Jon Boyce, who scored 28 points and snagged 19 rebounds. 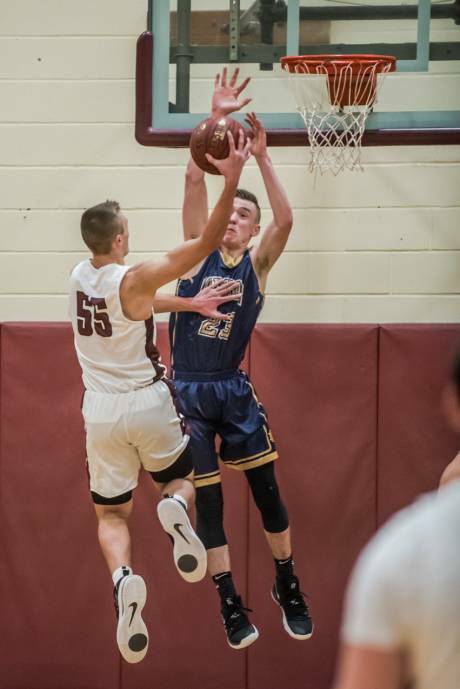 "John's one of the best players in Class D basketball," said his Coach Ciaci Zambito "The way he worked, the way he's gotten himself into shape and just his dedication, he deserves a game like tonight. He went out on his last home game against Notre Dame and I think he made a statement for himself. I'm super proud of him." 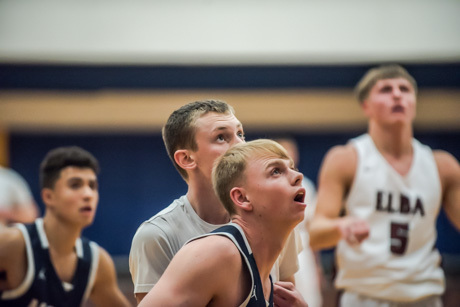 With Elba down two key players, Colton Dillon and Gregory Huntington, Boyce said he knew his role on the team but that didn't put any pressure on him. "It sometimes feels like it's on me but then again it's not on me because I look at our team, I look at who is out there, who's out there playing with me," Boyce said. "Everyone knows their roles. We all have our own strengths." 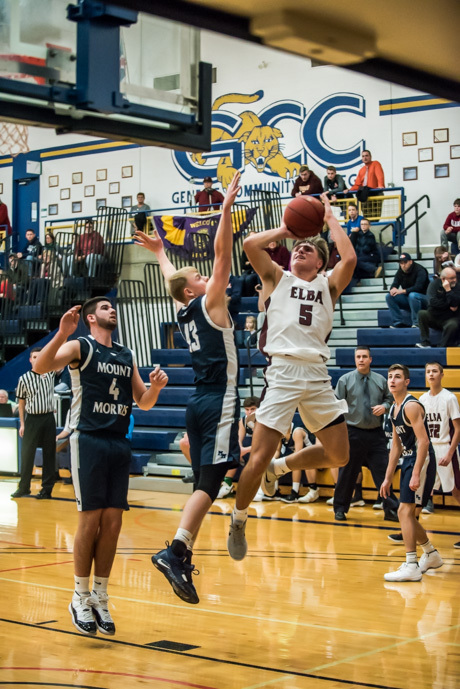 This game, freshman Zack Marshall stepped up and contributed 11 points, hitting three three-point shots in the second half to help give Elba the boost it needed to mount a comeback. For Notre Dame, Gabe Macdonald scored 15 points. 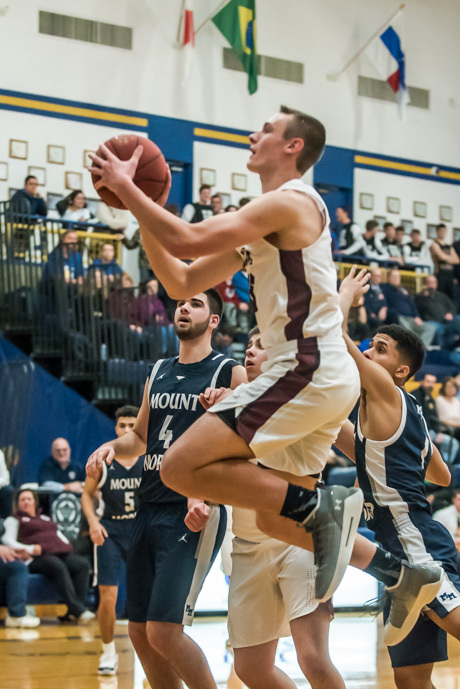 Misiti and Calarco each scored nine points. posted by Howard B. Owens in accident, news, elba. A person has been struck by a forklift at a location on Transit Road in Elba. The victim is having trouble breathing. Elba fire and Mercy EMS responding. Mercy Flight is unavailable due to weather. UPDATE 9:44 a.m.: Elba fire is back in service. UPDATE: The patient was transported by ground ambulance to Strong, according to the Sheriff's Office. There is no further information available at this time. posted by Billie Owens in news, elba. The Village of Elba is looking for a School Crossing Guard. Our current crossing guard has accepted a full-time job, we are only a couple of days away from having no crossing guard. This job would require someone to be available before and after school to assist children crossing the street. Anyone interested should call (585) 757-6889 or stop by the Village Office at 4 S. Main St. in Elba. posted by Billie Owens in news, notify, crime, batavia, bergen, elba, Alabama. Angela Marie Torcello, 35, of West Main Street Road, Batavia, is charged with: falsifying business records in the first degree; grand larceny, 4th -- using a credit card; and petit larceny. Following an investigation of an incident that occurred on May 8, Torcello was arrested on these charges. It is alleged that she used a credit card that she stole to purchase products from a traveling vendor. She was issued an appearance ticket and is due in Town of Batavia Court on Nov. 26. The case was investigated by Genesee County Sheriff's Deputy Jeremy McClellan. Rick Austin Drury, 21, of Judge Road, Alabama, is charged with DWI, DWI with a BAC of .08 percent or higher, and moving from lane unsafely. He was arrested following the investigation of a vehicle off the roadway on Ford Road in Elba at 3:55 a.m. on Nov. 10. He was issued an appearance ticket and is due in Elba Town Court on Dec. 19. The case was handled by Genesee County Sheriff's Deputy Mathew Clor, assisted by Deputy Andrew Mullen. Craig Hobart Sleeman, 38, of Victor, is charged with: DWI; aggravated DWI with a BAC of .18 percent or more and no priors; unsafe turn/failure to signal; failure to keep right; and moving from lane unsafely. He was arrested at 1:48 a.m. on Nov. 11 following a traffic stop on Main Street Road in Batavia. He is due in Town of Batavia Court on Jan. 28. The case was handled by Genesee County Sheriff's Deputy Austin Heberlein. Susan Michelle Rea, 45, of Sheridan Road, Bergen, is charged with DWI, refusal to take a breath test, and stopping/parking on a highway. Rea was arrested at 3:52 p.m. on Nov. 10 on Wortendyke Road near Route 33 in Batavia after she was allegedly found asleep behind the steering wheel of her vehicle. She was arraigned in Town of Batavia Court and released on her own recognizance. She is due in Batavia Town Court on Dec. 17. The case was handled by Genesee County Sheriff's Deputy Austin Heberlein. posted by Howard B. Owens in football, sports, news, oakfield-alabama, elba. Article by Mike Cintorino, OAE head coach. 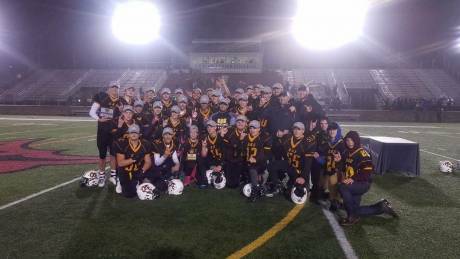 The Oakfield-Alabama/Elba Football Team completed a perfect season on Saturday, finishing 8-0 and defeating the Weedsport Warriors 48-6 in the first-ever New York Upstate Championship in Eight-man Football. Once again it was the defense, as it has been the last three games for OAE, that truly set the tone for the day. After an opening offensive drive stalled for OAE, the defense got the ball right back after a 3 and out. 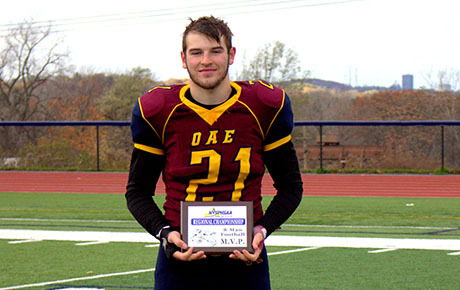 Colton Dillon, Section V Offensive Player of the Year, scored the first three touchdowns for OAE. Dillon finished with 128 rushing yards on 13 carries with scores of 2, 6 and 61 yards. Gage Dieterle (Section V Defensive Player of the Year) added to his resume, earning MVP honors for the game. Dieterle only carried the ball six times but ran for 119 yards and for two big scores with runs of 50 and 35. 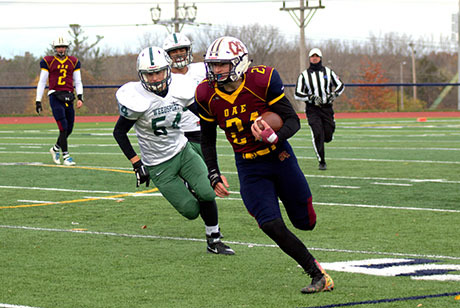 Ty Mott continued his strong season with 21 carries for 158 yards and a 44-yard touchdown. On the defensive side of the ball, Peyton Yasses led the team with 13 tackles while Dieterle had five tackles with two sacks, one forced fumble, and two fumble recoveries. Mott and Ty Kornow both came away with interceptions. 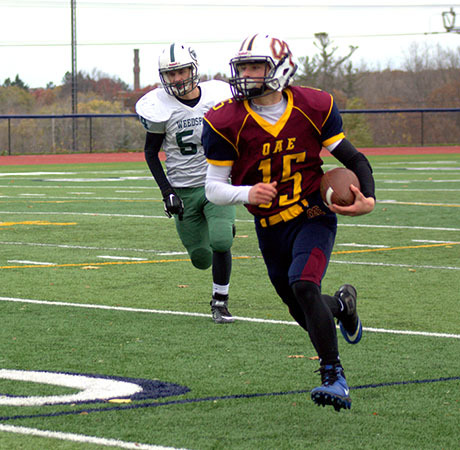 For the third-straight game, the OAE defense held the opposing offense out of the end zone. Weedsports lone score came on a 60-yard kickoff return by Hunter Morgan for a touchdown to open the second half. 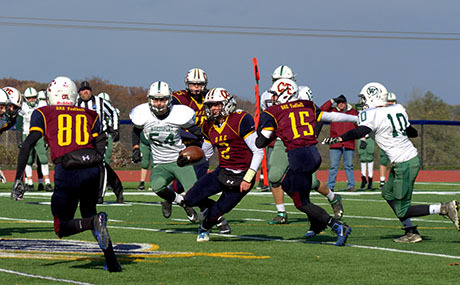 Jake Maloof led the Warriors with 87 yards on 13 carries. This has been an unbelievably successful season for the OAE team. The team overcame adversity with the switch to eight-man, learning to apply everything they have done in 11-man and apply it to this new opportunity. 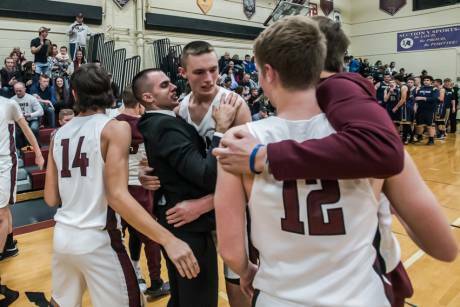 The team is 8-0 on the season, League Champions, Section V Champions, and NY Upstate Champions. Photos by Cindy Cassada . A one-vehicle rollover accident is reported in the area of 6638 Quaker Hill Road, Elba. posted by Lisa Ace in Elba Holiday Crafts, Vendors, show, Boy Scout Troop 6017 of Elba, Santa, elba. posted by Lisa Ace in Penny Social, Elba Firemen’s Recreation Hall, elba. posted by Howard B. Owens in sports, eight-man football, football, Oakfield, elba, Alabama. 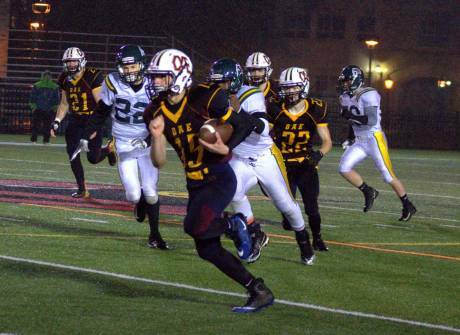 The OAE Football team defeated the CG Finney/Northstar Falcons 55-2 on Saturday night at St. John Fisher College to win the first ever Section V 8-Man Football Championship. OAE wasted no time, scoring on the first play from scrimmage with a 60-yard run by sophomore Ty Mott, his first of two scores on the night on his way to 160 rushing on only seven carries. Colton Dillon continued his dominance, with 4 rushing touchdowns, all in the first half, on his way to 132 yards rushing on just seven carries. Sophomore Jayden Hughes also had a big night with 104 yards rushing on just four carries, including an 82-yard touchdown run in the third quarter. Ty Kropelin added the other score for the OAE Football team who remains undefeated for the season and are ranked #4 in New York State. The defense once again held strong holding the Falcons out of the endzone, with their only points coming on a safety late in the game. Sophomores Ty Mott and Peyton Yasses each had 15 tackles while Nick Munger, Jayden Hughes, and Nick Wissinger all had interceptions. Gage Dieterle had four tackles for a loss including two sacks on the night. 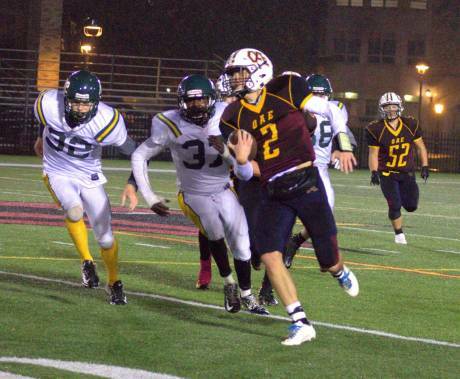 The OAE team had six total sacks total and forced four turnovers on the cold rainy night. Maalik Thomas led the way for the Falcons with 186 yards on 29 carries. The Weedsport Warriors will face off against Altmar-Parish-Williamstown in the Section III Championship game next Saturday at the Carrier Dome in Syracuse. 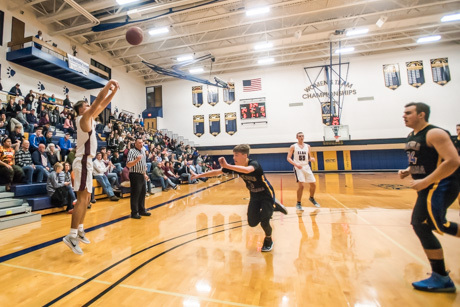 OAE will now face off against the winner of that game for the first ever Upstate New York Championship game on Saturday, Nov. 12th, at 12 p.m. at Pittsford Sutherland High School. posted by Billie Owens in Announcements, elba, batavia, richmond library, art. 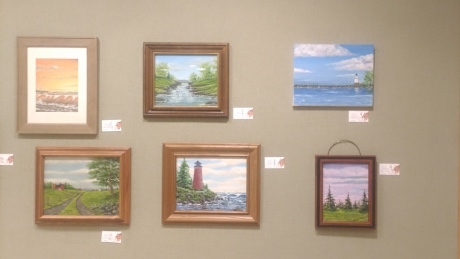 These are some of the works by native of Elba artist Andy Hare and they are being exhibited at Richmond Memorial Library in Batavia through Oct. 31. He retired after serving 25 years in the City of Batavia Fire Department and currently lives in his hometown of Elba. He and his wife, glass artist Dawn Hare, and daughter Hayley moved back after spending six years in coastal Georgia. "I've been painting for years and am self taught," Hare wrote us in an email. "I work in mostly oil, with a side order of watercolor. It's mostly nature, lots of skies and water. I like doing seascapes, golf scapes, and lots of lighthouses (they sell pretty easy!). posted by Howard B. Owens in Marc Molinaro, Larry Sharpe, news, notify, elba, steve hawley. When Larry Sharpe was last in Genesee County, speaking to the members of SCOPE, he rejected the idea that he's the spoiler candidate in New York's gubernatorial race. He said he's got momentum, strong social media support (the mainstream media doesn't see him coming, just like Donald Trump, he said), and is drawing in not just Republican voters, but Democrats and Independents. A Gravis Marketing poll from two weeks ago showed Sharpe drawing about 13 percent of the vote, or about 13 times more than any previous Libertarian candidate for governor. Marc Molinaro, the Republican running for governor, Sharpe said, is the spoiler, not, this time, the Libertarian. Asked about Sharpe's barb while in Elba on Friday, Molinaro sidestepped the question. 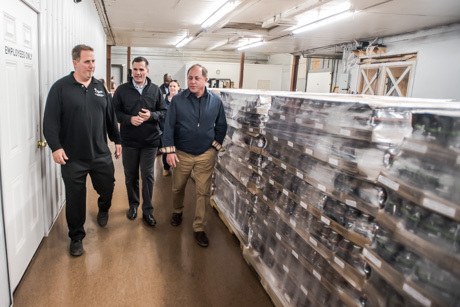 "Listen I don't know him," said Molinaro, who had just arrived at Oliver's Candies. "I've met him twice in my life. I'd venture to guess that most New Yorkers have just heard of him over the last year. I don't know. I'm sure there are plenty of people who want to support a Libertarian candidate and they have every right to do that. I'm not going to second-guess that. We're eating candy." The controversy of the morning was a commitment by Gov. Andrew Cuomo to "debate" Molinaro on WCBS. Apparently, Cuomo had appeared on the show Friday and said he would clear his schedule Saturday morning to appear on air with Molinaro. Cuomo said he would phone it in. "Listen, what was offered up this morning isn't a debate," Molinaro said. "It's a theater production." He later added, "New Yorkers are being treated like they don't deserve or don't have any right to having two candidates come before them and answer questions. No, I'm sorry that's not a debate. It is a fraud." The "two candidates" phrase wasn't Molinaro's statement during the short interview outside of Oliver's Candies in Elba that verbally excluded the other candidates in the race. Pressed about his seeming exclusion of Sharpe from a debate, Molinaro said, "We've already agreed to debates that include all candidates. They need to include the Governor, too." 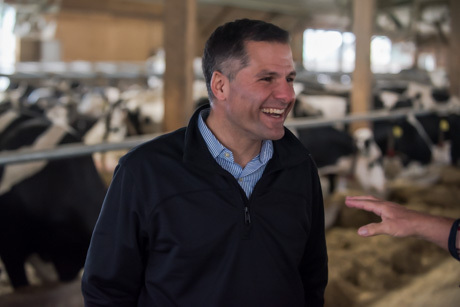 Molinaro was in town with Assemblyman Steve Hawley to tour small businesses, meet with small business owners, and then attend Hawley's 11th annual campaign fundraiser at Batavia Downs. 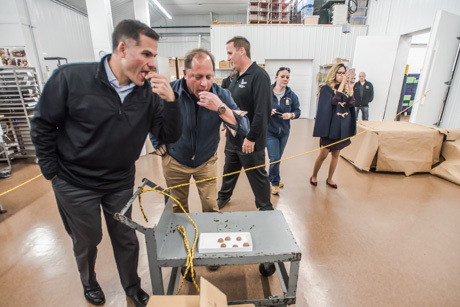 The first stop was Oliver's Candies, which was celebrating Friday and Saturday the grand opening of its new production facility in Elba. 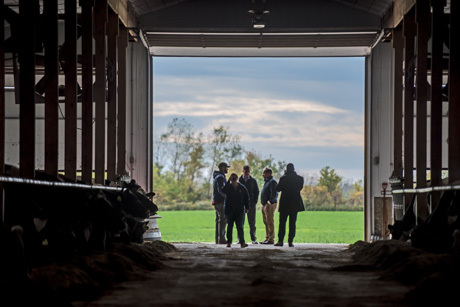 The local business tour included a stop at Post Farms, with Jeff Post, in Elba (bottom two photos), and Chapin Manufacturing in Batavia. Molinaro said he understood how tough it is for small businesses to survive in New York. "The seismic increases in the minimum wage over a short period time has cost money," Molinaro said. "The fact that property taxes continue to rise is a burden on small business owners so they get it regardless of what they're producing. But listen if you're going to visit a business it should be sweet." 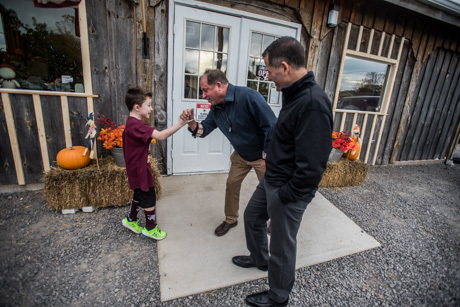 Top photo: Adaiden Hyman and his mother were visiting Oliver's on Friday as a treat for his birthday; Hawley and Molinaro stopped to wish him a happy birthday. posted by Howard B. Owens in Oliver's Candies, elba, business, news. 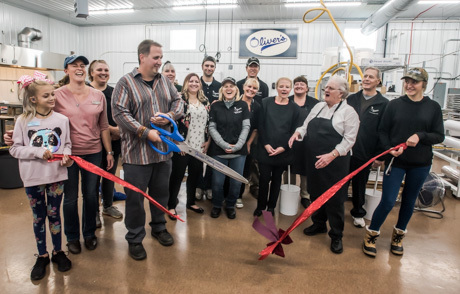 Jeremy Liles, owner of Oliver's Candies, with the help of his family and employees, made the company's new production facility in Elba today official with a ribbon cutting. 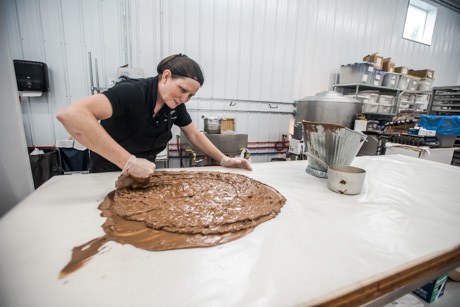 Oliver's hosted two days of open houses in the candy factory and the satallite candy and ice cream shop on Main Street, Elba. 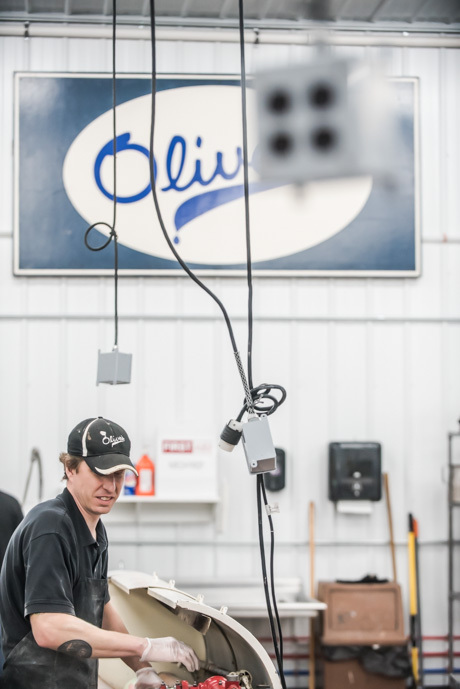 Liles moved production from the Main and Oak location in Batavia, so the business could expand, while keeping the store in Batavia. That store will also expand now that candy production has been moved to Elba.